Update your contact information on the Go Digital Online Form at https://godigital.allianzpnblife.ph/ and subscribe to eNotices. • Every in-force policy you update will earn you one raffle entry. • You can update your contact information several times throughout the promo period, but only your first update will earn you raffle entry/ies. 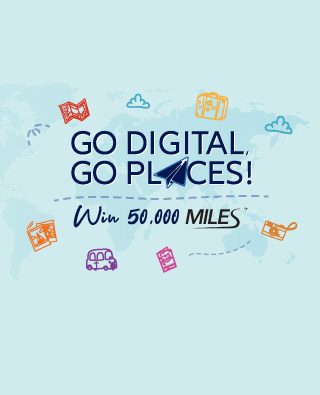 • The Go Digital, Go Places! promo is open to all Allianz PNB Life policy owners (customers) with at least 1 in-force policy issued by Allianz PNB Life, PNB Life, or New York Life. • All employees and Financial Advisors of Allianz PNB Life, its affiliates, and advertising agencies are all disqualified from this promotion. • One raffle winner will be drawn every month via an electronic raffle every 1st day of the month from April to September. • A customer can only win once. Non-winning raffle entries from previous months will still be qualified until the last raffle draw. • The customer shall be disqualified from the promo in the event that his/her policy is found to be lapsed, or if the policy is suspended, cancelled or terminated within the promo period and during the raffle draw. • Winners will be notified by Allianz PNB Life via email and SMS. • Prize will be credited to the winners’ Mabuhay Miles account. • To claim the prize, winners must acknowledge the email notification from Allianz PNB Life together with their names and member ID registered at Mabuhay Miles and within 60 days from the receipt of notification. Failure to do so will result to forfeiture of the prize in favor of Allianz PNB Life. • Prizes are not transferrable or convertible to cash. • Winners should agree to be featured in publicity materials.